For the first time in our history of offering MRE's, canned and freeze dried foods, we have found a canned butter that is imported from New Zealand that actually tastes better than any gourmet butter we had ever tried and with an indefinite shelf life, no refrigeration is necessary! Refrigerate unused portion in a separate container. GREAT FOR CAMPING! PERFECT FOR THE BOAT OR RV or your survival food pantry as well as daily use! For years we've had people ask us about storable butter, and we've had to turn them away. Now you can have smooth, creamy, high-quality butter . . . and who cares if the electricity goes off? And the best part (besides the great taste), is the list of ingredients; Pasteurized Cream and Salt - that's it! No preservatives, food colorings or chemicals of any kind, just naturally made wholesome butter from down under. This can contains 12 oz of butter - which works out to three traditional sticks of butter, and this package is for 1 can total. NOTE: Minor denting that will not affect shelf life may occur with some cans during transit no matter how well we pack them. Please let us know if any of your canned foods have dents that will affect the shelf life and you won't be refrigerating soon as we may need to make a UPS claim. We recently picked up some great long shelf life canned foods and they are selling even better than expected. I decided to do a taste test today on a few of them and we're all shocked at how good they are. I opened up a can each of the bacon, turkey chunks, pork sausage and the bread. None of us liked the bread, however, the rest are awesome! I think we all like the bacon the best. There is quite a bit of full bacon stips (not dehydrated and ready to eat right out the can) wrapped in wax paper in the can. I eat all kinds of crazy things but Lisa, David and Loree also loved the canned turkey, canned pork sausage and the canned bacon. I was surprised by how tasty and full of flavor they all are. In fact, we're all filling up on it and are having it for lunch today. The three cans of meat is more than enough food for the 4 of us. The bread isn't horrible, we all agree that it kind of tastes like molasses bread that has been in a can. I know, not a very good description but it's the best we can do for now. The bread is moist and a little crumbly but doesn't compare to the full, rich flavor of the other long shelf life canned foods we tested. Over time, we might do taste tests on more of our canned foods, but I hope this gives you a good idea of all our long shelf life canned foods since they come from the same company. We started offering these canned foods just a few monthsa ago and they are already amoung our best selling products. We stock more and more of these long shelf life canned foods every week. We have a steady, current and brand new supply that we receive weekly. We ship them out almost as quickly as we get them. We are also preparing one year food supplies with these items so stay tuned for that. Also, we are adding new canned food items every month. Even thought they are moving so fast, our shipping department is keeping up with demand and shipping as soon as possible. We ship from our warehouse in NC. There is no expiration date on any of the Yoder's cans because we go through the expense of doing an accelerated shelf life study on all of the products we develop. If you can prove that the shelf life is equal or great to 5 years, the USDA and FDA doesn't require a "Best By" or "Expiration" date. However, they do require a date of manufacture be on the can. In the case of all the Yoder's Products we stamp the date on the bottom of the can in a Julian format. You will notice that there are two lines of numbers and letters on the bottom lid the first one is the date. The letter you usually see is the line it was produced on, and the next 4 digits is the date. Of the 4 numbers, the first one represents the year and the next 3 numbers are the day of the year (out of 365 days). 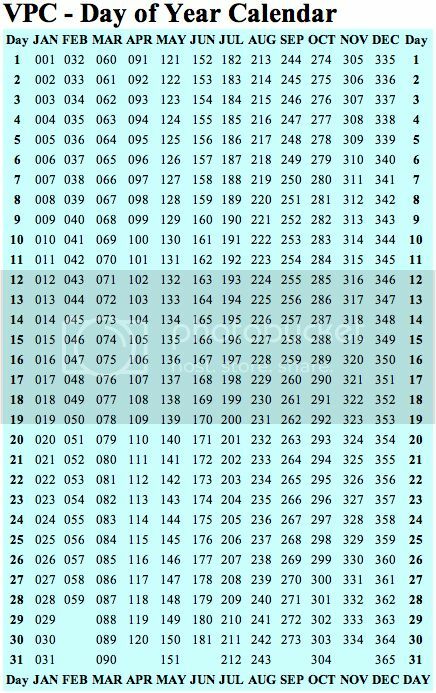 For example, if you see something like B8336, B would be the production line the rice was assembled on (more for our tracking purposes as required by the USDA), 8 would be for 2008 and 336 would be for the 336th day of the year or translated using the below "Day of the Year" calendar. TIP >>> Another thing to consider is stocking food for emergency preparedness is fat. In many difficult situations you could be under very strenuous activity and you may also only have powdered milk for growing children that need fat to grow their bodies and brains. Powdered milk and other food and drink products will be missing that important fat. This canned butter is a great source of fat and you could even add a tablespoon to your powdered milk to give it that good fat content, or simply add it to other foods. With such a terrific shelf life and great tastes this canned butter is an extremely important part of emergency preparedness plan if you can manage to keep from eating it on a daily basis. You will be truly surprised at how good this butter is. Ballantyne is a family owned company which for more than half a century has been serving a global market for fine foods from one of the world's richest food producing nations. The dairy division produces a range of packaged butter, dairy blend and margarine products. This encompasses portion control products (minitubs and mini wraps) to retail products (tubs and wraps) for the Australian and international markets. We are also proud to be the largest producer of canned butter in the world. Our brands include Ballantyne, Golden Churn, Red Feather, Wood Dunn, Blue Triangle and Hammer. Recently Lisa made some very tasty food with our canned meats and canned broths and brought it in for all of us to share. Please see below a couple great recipes that had us all asking for seconds. Maybe it's too much (or maybe not), but I would even add our canned bacon to both recipes too. Plus we also sell the big cans of spices as well as smaller spice selections such as these. The G.I P-38 Can Opener or G.I. P-51 Can Opener became popular with the troops during World War II and are still popular today. People love keeping them handy in their homes, backpacks, or keychains because they make such small, handy survival tools. These can openers are a great deal at a small price. You may want to even consider stocking up and taping one to each of your emergency canned food items you have in storage. This way, no matter what you'll always have means to open those emergency cans! MY WIFE WAS A CHEF AND LOVES TO COOK WITH BUTTER. RED FEATHER IS THE BEST BUTTER SHE HAS EVER TASTED. IT WAS TOO HARD IN THE FRIG., SO WE MOVED IT TO THE PANTRY WITH THE PEANUT BUTTER AND SYRUPS, IN A SEALED CONTAINER WITHOUT ANY ILL EFFECTS AND THE 2 OF US MADE IT LAST 2-WEEKS. WE ARE ORDERING A CASE. We finally got to open a can after using all the butter I stored in freezer. Very creamy when first opened. Hardens after being in fridge. Fairly good flavor. Have a case in storage. Worked very well in baking. Bought several cans because we wanted ro try canned butter. We were not disappointed, it came out solid and we transferred to a plastic container for the fridge. Looks tasted and works like any quality butter we have used. Would recommend for food storage, camping or hunting camp. We are really satisfied with the product. It beats tha dried butter powder hands down. Only wish it was made in the US. I can't believe it is butter!!! This is a great product, I received my order and the first thing I did was open one to try it out, seeing the few reviews on the butter I had to try it. Boy is this some great butter!!! the can was gone in 2 days, we used it for cooking on the pan, in mac and cheese, on pancakes, and on baked potato, and the results are in!!! BUY IT!!! this butter is as good if not BETTER than the butter I buy in the store, color, creaminess ( is that a word?) flavor, all are great, borderline awesome. it cost's a little bit, but if you want butter in the pantry, get it, this is a great product. AWESOME PREP! I got in 2012 and have used many times! ALtho the can (and co. reps) say to "refrigerate unused portion"- I would highly rec (post SHTF/NO electric scenario) to simply buy a "BUTTERBELL BUTTER KEEPER" - this is what is commonly used in Europe and elsewhere inc the Australian bush and many countries who don't have electric. (ever notice the tiny refrigerators overseas?) Butter kept in a ButterBell with a tiny bit of water added will last shelf stable up to 30days. As long as you change the water ever few days. I have tested/done/ate this many times. This tastes like 'old fashioned churned creamery butter" and very rich and HEALTHY as it is 100% GRASS FED which is usually done in New Zealand. My cousin grew up there! Im buying another case today for preps/trade. I have numerous cans of this butter in my food storage and I just used up a can to make sure it was good. It tastes just like butter and I will be buying more. Just opened a can of butter that is five years old. Has been stored in the basement where it is cool. Just as good as the day I bought it. Finally tried a can of this butter and wow, tastes better than store bought stuff and melts great and even spreads well, hope Camping survival gets more in, this is must buy item for us now. I am from Peru and my parents served us this butter over 30 years ago...we had to import it but it was worth every monies spent on it. We loved it!! it has this rich flavor that I have yet to taste in any of the butters I have tried here in USA. I have not seen this item being sold in markets here...California..so I order from wherever I can get them...Thanks Camping Survival for bringing this item to your inventory! This product tastes great, stores for an indefinite time at 60-65 Degrees F and is indispensable in cooking and enhancing marginally palatable foods on hand to extend your survival stores. Perfect for serious barter WTSHTF and refrigerators are history. Did we mention it has great taste?! Will buy more, we<br>love it! Thank you! Bought a few cans to try it out first. Took them with us on a camping trip in the Bitter-Roots. This butter may be better than the store bought stuff!! So I bought a full case. Thanks for such a good product!! This is REAL butter. It tastes like real butter because it is. It melts great. Use it like you would in any recipe or just plain on your piece of bread. <br>The huge advantage here is that it stores well without refrigeration. This makes it perfect for food storage and for the times when you forget to pick some up at the store during your grocery shopping. My husband and I tried our canned butter last night and it was great! It actually tasted better than the regular butter we usually buy. As soon as it comes back in stock I plan to buy several cans for our hiking and 4 wheeling trips. I won a can of butter and cheese a few weeks ago and was saving the cheese for a special occasion. I finally gave in and opened it today. It was very tasty and had a smooth texture. It was a lot sharper then I expected it to be, which was a pleasant surprise! Howdy Camping Survival! I once a recent contest where I received a free can of Red Feather Butter and Cheese! You asked for testimonial, and this is one. I\'ve popped open the butter to have on some sourdough loaf with my clam chowder for the evening, and I have to say, it really IS the best better I\'ve had in a long ti...me. Can\'t wait to try the cheese next! I was lucky enough to win one of these babies in a facebook give-away. I opened it up this morning and tried it on some toast for breakfast. It was really, amazingly good. I\'d even say it was a little bit better then my usual butter. This isn\'t \"camping survival\"" if you pack it along on a camping trip... it\'s Fine Dining in the middle of the wilderness."